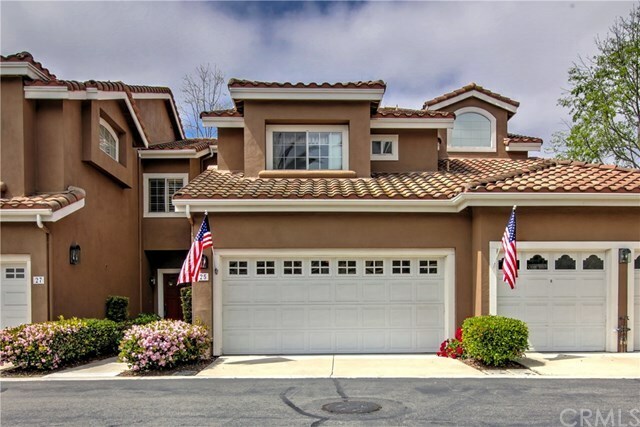 This beautiful 2 story upscale townhouse is the ONLY home for sale located in the gated community of Provence DâAliso in lovely Aliso Viejo. This highly desirable floorpan features soaring ceilings, lots of natural light and an open living space. The Living room features a fireplace, rich laminate hardwood floors that open to the formal dining room. Upgraded kitchen with cherry cabinetry, gorgeous granite, stone backsplash and newer appliances. Two very spacious bedrooms with their own upgraded full baths as well as an office/bonus room/loft that could be converted into a third bedroom. The charming remodeled powder room has a contemporary sink and crystal black granite countertop. The laundry facilities are in the 2 car ATTACHED garage. Outside you will find yourself in the tranquil oasis backyard patio area that has been professionally landscaped with fruit trees providing optimal privacy. Enjoy resort style living with community amenities including swimming pools, spas, a gym and tennis courts. Conveniently located with easy access to Toll roads & freeways. Direct access to the biking and hiking trails, and within 1.5 miles of the restaurants, shops & theaters at Aliso Town Center. This is your chance to own minutes to Laguna Beach!